On this episode of DTB’s “Dream Tour”, the folk rock artist, Frank Turner, discusses their ultimate tour lineup, while on tour with Lucero and The Menzingers. On this episode of DTB’s “Gear Masters”, the folk rock artist, Frank Turner, shows off the gear that he uses onstage, while on tour with Lucero and The Menzingers. 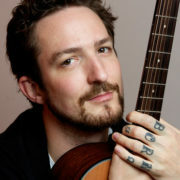 Frank Turner is currently touring in support of his newest album, Be More Kind.